Beautyworld Middle East, the region’s largest international beauty and wellness trade fair kicks off tomorrow (May 14), with 1,580 exhibitors from 60 countries out to impress more than 35,000 visitors over three days at the Dubai International Convention and Exhibition Centre. Product launches from the world’s biggest brands and start-ups alike will share the stage at the 22nd edition of the three-day event, with organiser Messe Frankfurt Middle East confirming at least 100 companies will make a bow with their latest offerings seen for the first time in the region. Whether it’s the world’s first anti-aging beauty chocolate, mineral water dispensers infused with precious gemstones, exclusive niche fragrances, or organic skincare products made from native Hawaiian plants, Beautyworld Middle East will once again be the annual platform of choice for global manufacturers to introduce their newest wares, saifd the organisers. Bollywood star Kareena Kapoor will also launch a product-line for Indian manufacturer Olivia Cosmetics on the second day of the annual showcase. The UAE company is a regular Beautyworld Middle East exhibitor. This year, it is launching davines, an Italian eco haircare brand with its roots founded on sustainable beauty. 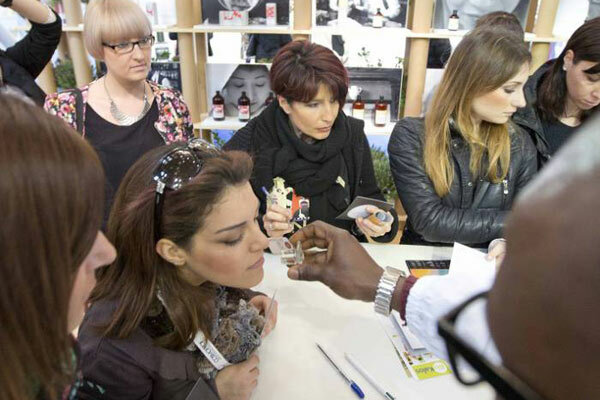 EIDEAL will also have a shampoo lab at its stand, where a chemist will be on hand to customise a davines’ shampoo product based on a visitor’s needs and scent preferences. Esthechoc is the world’s first anti-aging beauty chocolate. According to its inventor Dr Ivan Mikhailovich Petyaev, a former scientist at Cambridge University, the so-called ‘nutricosmetic’ slows down the skin’s aging process through a combination of highly potent active substances: Astaxanthin – the most powerful antioxidant known to science – and Cocoa polyphenolic epicatechins, which are found naturally in chocolate. The Australian-owned brand is a hair tool range featuring unique patented Japanese mineral technology. Each of the EVY products feature 32 natural negative ion-generating minerals. This unique blend of post-volcanic minerals injects hydration and moisture into the hair during styling. The entire EVY range, including hair dryers, curling irons, brushes, and the 2017 AHFAs Most Innovative New Styling Tool Winner – the EVY iQ-Oneglide, will be launched for the first time in the region at Beautyworld Middle East 2017. VitaJuwel is exhibiting for the second year in row, and this year launching its gemstone-infused water bottles, vials, decanters, and dispensers. Daniel Eisen, the CEO of VitaJuwel, said its handcrafted glass products vitalise water by restoring its original quality with a selection of precious gemstones. From its stand in the US Pavilion (one of 22 country pavilions at Beautyworld Middle East), Hanalei will launch a complete range of personal care products such as lip treatments, scrubs, facial masks, lotions, and other body care items. Perfumer Ulrich Lang from New York will launch his latest unisex scent, APSU at Quintessence – an exclusive showcase of niche high-end fragrances. Its scent is a nod to a simpler lifestyle — a contrast to today’s complex world. Spanish company Lakme Cosmetics manufactures professional hair colour and hair care products. At the Spanish Pavilion this year, the Barcelona Company is launching i.plex, an innovative anti-aging plex system with a keratin complex that restructures the hair, dramatically improving combing and manageability and increasing resistance to breakage by 44 per cent. Beautyworld Middle East 2017 will be the setting of skincare manufacturer Neoderma’s biggest relaunch since it was first created in 1991. Headquartered in Cyprus, Neoderma will also launch Neo-White – a whitening product line with Halal certification. Pennelli Faro from Italy is an internationally recognised manufacturer of brushes and accessories for Cosmetics and Fine Arts. The company is also very eco-conscious; among its long list of product launches this year is Ecosophy, a vegan-friendly make-up brush collection. Hyunjin C&T is a new player in the regional beauty market, and is introducing its entire range of innovative products that involve the use of gold leaf, magnetic therapy, and oxygen therapy.